Orthopedic devices are used to prevent and treat deformities and injuries of the musculoskeletal system. 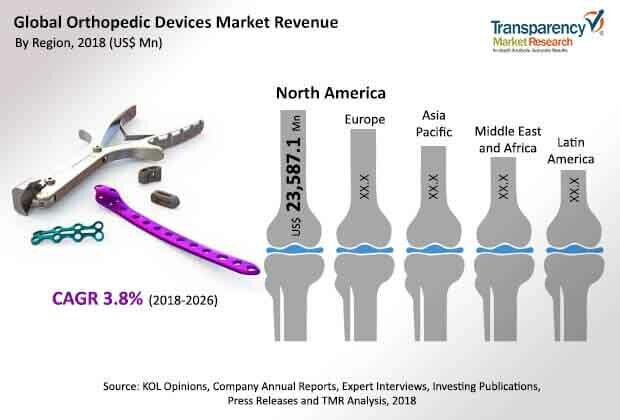 In terms of revenue, the global orthopedic devices market was valued at US$ 46,900 Mn in 2017 and is anticipated to reach US$ 65,000 Mn by 2026, expanding at a CAGR of over 3.0% from 2018 to 2026. Increase in incidence rate of injuries and surge in adoption of technologically advanced products to treat musculoskeletal disorders are likely to drive the global orthopedic devices market from 2018 to 2026. Incidence of accidental injuries during sports, driving, and adventure has increased drastically in the last decade. According to available data, every year over 2 million patients visit the U.S. emergency departments for head trauma related injuries. Large number of global manufacturers are putting constant efforts to develop and manufacture novel orthopedic products to meet the medical need of patients. Demand for advanced technologies such as minimally invasive surgery (MIS), navigation technology, 3D bioprinting and tissue engineering, and custom made implants is increasing. Key players are focusing on the development of new devices with better efficacy. For instance, Medtronic launched the titanium 3D printed platform, TiONIC Technology, which enables incorporation of integrated surface technologies and complex designs in spine surgery implants. Such key developments are likely to augment the global orthopedic devices market in the near future. However, incidence of product recall due to device inefficiency or manufacturing errors affect the adoption rate of these devices among surgeons and patients. This is likely to restrain the global orthopedic devices market during the forecast period. The global orthopedic devices market can be segmented based on product, end-user, and region. In terms of product, the joint reconstruction segment is projected to dominate the market, however, it is expected to lose market share during the forecast period due to less opportunities for new entrants in the segment. Moreover, stringent FDA regulations resulting in longer waiting period for product approval limits the entry of new players in the segment. The spinal devices segment is likely to expand at the highest CAGR during the forecast period. Increase in demand for minimally invasive approach for spine surgery and rise in incidence of spinal fractures among the geriatric population are the key factors fueling the growth of the segment. Based on end-user, the hospitals segment led the market in terms of revenue in 2017. However, the segment is projected to lose market share during the forecast period due to rise in preference for orthopedic clinics among patients for treatment. In terms of region, North America held a major share of the global orthopedic devices market in 2017. High cost of technologically advanced surgical procedures and increase in prevalence of orthopedic diseases are the factors that propel the market in North America. Moreover, favorable reimbursement for the treatment of different musculoskeletal disorders under Medicare policy boosts the growth of the market in the region. In terms of revenue, the market in Europe and Asia Pacific is projected to grow at a rapid pace during the forecast period. Rise in prevalence of orthopedic disorders and awareness about the treatment and usage of different devices to treat different injuries in countries such as Brazil and South Africa are likely to boost the market in Latin America and Middle East & Africa. Key companies operating in the global orthopedic devices market which are profiled in the report include Stryker, DePuy Synthes, Zimmer Biomet, Smith & Nephew, Medtronic Spinal, DJO Global, Arthrex, Inc., NuVasive, Inc., and Globus Medical. These players are adopting organic and in-organic growth strategies to expand their product offerings, strengthen their geographical reach, increase customer base, and gain market share. For instance, in January 2016, NuVasive, Inc. acquired the U.S.-based Ellipse Technologies Inc. This acquisition helped NuVasive, Inc. provide Ellipse Technologies, Inc.’s novel technology of magnetic adjustable implant systems to its customers. In terms of product, the global orthopedic devices market has been segmented into joint reconstruction, spinal devices, trauma fixation, orthopedic prosthetics, arthroscopy devices, orthopedic braces and supports, orthopedic accessories, and others. The joint reconstruction segment has been classified into hip replacement, knee replacement, elbow and shoulder replacement, and others. Hip replacement has been categorized into total hip replacement implant, partial hip replacement implant, hip resurfacing implant, and revision hip replacement implant. Knee replacement has been divided into total knee replacement implant, partial knee replacement implant, and revision knee replacement implants. The spinal devices segment has been bifurcated into spinal fusion devices and spinal non-fusion devices. The trauma fixation segment has been segmented into metal plates & screws, pins/wires, nails and rods, others. The orthopedic prosthetics segment has been bifurcated into lower extremity orthopedic prosthetics and upper extremity orthopedic prosthetics. The orthopedic braces and supports segment has been classified into upper extremity braces and support low extremity braces and supports. The orthopedic accessories segment has been categorized into bone cement, casting system, and removal systems. The product type segment have been analyzed based on different type of devices uses to treat different orthopedic disorder in various regions. The market size and forecast for each of these segments have been provided for the period from 2016 to 2026, along with their respective CAGRs for the forecast period from 2018 to 2026, considering 2017 as the base year. In terms of end-user, the global orthopedic devices market has been classified into hospitals, orthopedic clinics, ambulatory surgical centers, and others. The market size and forecast for each of these segments have been provided for the period from 2016 to 2026, along with their respective CAGRs for the period from 2018 to 2026, considering 2017 as the base year. The global orthopedic devices market has been segmented into five major regions and key countries/sub-regions in the respective region: North America (the U.S. and Canada), Europe (the U.K., Germany, France, Italy, Spain, and Rest of Europe), Asia Pacific (China, Japan, India, Australia & New Zealand, and Rest of Asia Pacific), Latin America (Brazil, Mexico, and Rest of Latin America), and Middle East & Africa (GCC Countries, South Africa, Israel, and Rest of MEA). The market size and forecast for each of these regions and the mentioned countries have been provided for the period from 2016 to 2026, along with their respective CAGRs for the period from 2018 to 2026, considering 2017 as the base year. The research study also provides the competitive scenario in these regions.